TrainTrax is a music middleware, enabling speaker sharing across platforms and devices. 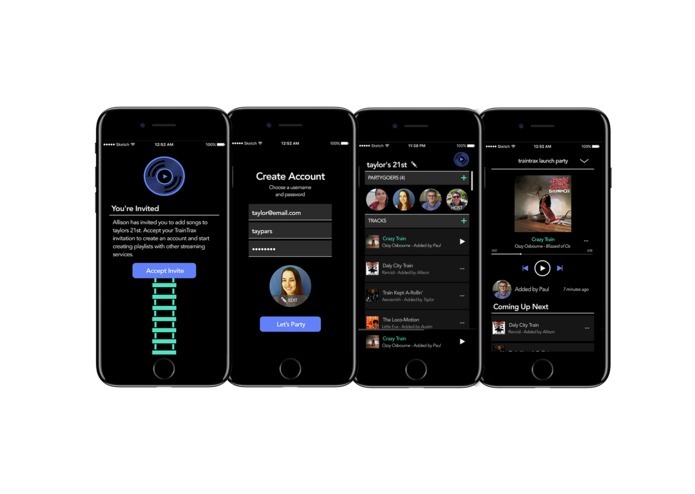 The TrainTrax app allows friends with different music streaming services to add to collaborative playlists. Friends who have been invited to a TrainTrax party (collaborative playlist) can find their favorite songs to add to the common queue. Get invited to a party and add your favorite songs. You use Apple Music. Your friends all use Spotify. But you're all stuck in a car together on the way to Tahoe and have the perfect song to add to the road trip playlist. With TrainTrax, you can all add songs to the same playlist without passing the streaming device around or hassling with aux cords. Have you ever been out with friends on a road trip or at a party and wished there was a way to more seamlessly share music? 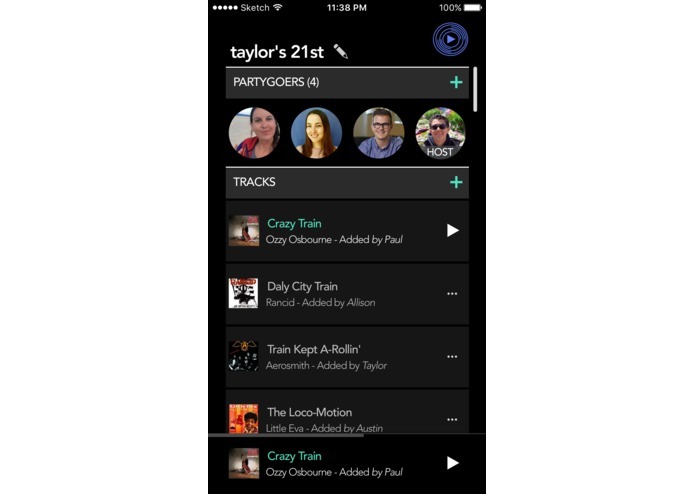 TrainTrax is a music streaming middleware that lets cross platform users share music without pulling out the aux cord. 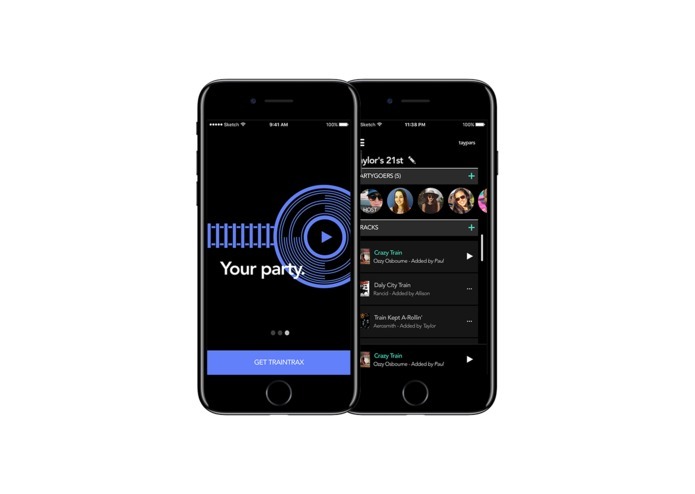 The app authenticates a “host” user sign through their Apple Music or Spotify Premium accounts and let's them create a party where they can invite friends to upload music to a shared playlist. Friends with or without those streaming service accounts can port through the host account to queue up their favorite songs. Hear a song you like? TrainTrax uses Button to deep links songs directly to your iTunes account, so that amazing song you heard is just a click away from being yours. The application is built with Swift 3 and Node.js/Express. 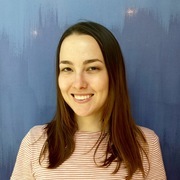 A RESTful API let’s users create parties, invite friends, and add songs to a queue. The app integrates with Button to deep link users to songs on iTunes, letting them purchase songs directly through the application. • The application depended a lot on third party tools, which did not always have great documentation or support. • This was the first hackathon for three of our four members, so a lot of the experience came with a learning curve. In the spirit of collaboration, our team approached this as a learning opportunity, and each member worked to develop a new skill to support the building of the application. The end result was an experience focused more on learning and less on optimization. • Rain. • SDK Integrations: Successful integration with Apple Music and Spotify SDKs! • Button: Deep linking with Button • UX: There are some strange UX flows involved with adding songs to a shared playlist, but we kicked of the project with a post-it design thinking brainstorm session that set us up well for creating these complex user flows later on. • Team bonding: Most of us just met on Friday, and we built a strong fun team culture. Everyone on our team learned different things. Front end developer. Obsessed with pixel-perfect layouts and weird button animations.